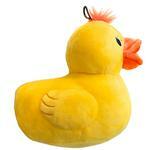 Your pup will be feeling just ducky with the DJ Duck Lulubelles Power Plush Dog Toy! The DJ Duck Dog toy is crafted with Power Plush technology where it's soft on the outside but tough on the inside! Each whimsical POWER PLUSH toy is backed inside with an extra layer of durable mesh fused on the inside to make these high-quality, soft plush toys hold up to the scrappiest canines! No loose pieces No loose pieces and each seam is reinforced using nylon seam tape for extra strength. All toy material used is safe, non-toxic and has no heavy metal. Squeeze! Squeak! Each toy has a squeaker inside! Power Plush is dedicated to Safety! They are made with non-toxic dyes and comply with the U.S. and European children’s toy standards. Posted On 01/06/19 by Korena S from King City, OR Yes, Korena S recommends this product! So cute and well made. My dog loves playing with it and finding the squeak! I like to shop at BaxterBoo. They have a great selection of merchandise. I always find something for my dog. Their customer service is very helpful. There is no problem with any returns. I recommend BaxterBoo to everybody.